The officiating in Kilkenny v Waterford, Clare’s inconsistency and more topics arising after Saturday’s games. Kilkenny's Richie Hogan and Kevin Moran of Waterford. Instead of discussing Kilkenny’s resilience, we were left reflecting upon the standard of refereeing and officiating in Thurles last night. James Owens hit the headlines with his decision to disallow Matthew Ruth’s late point, as he whistled for full-time. But Jake Dillon was clearly in the square when he netted an extra-time goal for Waterford and umpires also failed to spot that Richie Power’s first half penalty hit the underside of the crossbar and then the back stanchion of the Town End goal. The green flag was eventually raised but only after a period of consultation between referee and the men in white. 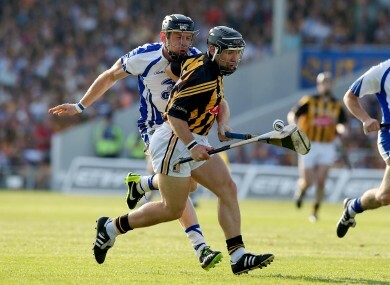 But all of that shouldn’t detract from Kilkenny and their remarkable refusal to yield. And even when Ray Barry netted an 88th minute equalising goal, the Cats refused to panic and hit three points to make the game safe. They may be vulnerable and on the ropes but Kilkenny now have two weeks to regroup before the quarter-finals and have negotiated tricky obstacles in Waterford and Tipperary. And manager Brian Cody maintained that Henry Shefflin did not suffer a recurrence of his foot injury last night. Waterford had some outstanding individual performances on the night but ultimately; they lacked that killer punch, the x-factor that could have put Kilkenny away. Perhaps John Mullane would have provided it, or even Eoin Kelly, but we’ll never know. It’s a credit to the Déise that they performed so well without a host of key players from last season, with Stephen Molumphy, Philip Mahony and Stephen Daniels also unavailable for various reasons. Between the sticks, Stephen O’Keeffe justified his recall after the Munster championship once again with an outstanding performance while out the field, Darragh Fives and Kevin Moran were superb. Unfortunately, it looks like we’ve seen the last of Tony Browne in a Waterford shirt but perhaps Seamus Prendergast can be convinced to stay on for another season on the back of his good form this year. There’s a really good team in Clare just waiting to burst through. But when they should have sewn up yesterday’s qualifier against Wexford, the Banner men were instead left hanging on after coughing up a six-point lead in the last 15 minutes. Clare had 16 wides over the regulation 70 minutes but they still created numerous chances and Mark Fanning was inspired in the Wexford goal. But Clare’s inability to kill off Wexford allowed the Slaneysiders back into it, when they shouldn’t have been given the chance to do so. Clare need to tighten up on their shooting and tweak their game just a bit but if they do, they can still have a real say in this year’s championship. Davy Fitzgerald has faith in his players to deliver the goods and they’ll still believe that they’re as good as anybody out there. And with good reason. Wexford were pilloried for the nature of some of their tackling in the Leinster SHC replay against Dublin at Parnell Park and they let themselves down again yesterday. There were a couple of really unsavoury incidents that went unpunished by Diarmuid Kirwan but in the referee’s defence, these were off the ball occurrences. Bobby Kenny walked for two yellow cards in extra-time but he was involved in a first half incident with Pádraic Collins that could have earned him at least a yellow card. And captain Garrett Sinnott, who should have been sent off against Dublin, got away with another head high challenge. This over-physicality is wholly unnecessary as Wexford have a decent platform to build on and on the back of serious minor and U21 progress, they could emerge as a consistent senior force once again. 5. Is this the greatest hurling championship ever? In his post-match analysis, Kilkenny manager Brian Cody hailed the “magnificence” of the unpredictable, crazy story that is the 2013 All-Ireland senior hurling championship. It’s a throwback to the revolution years of the 1990s when the old cliché that any team can beat anybody else on a given day certainly rings true. What odds would have you have got on both of yesterday’s games finishing level after 70 minutes? Patrons who decided to stay on for both games certainly got their money’s worth and while there may have been some bleary eyes in the cars home, the 17,235 spectators at Semple Stadium were royally entertained. Email “5 talking points from yesterday's GAA action”. Feedback on “5 talking points from yesterday's GAA action”.